The “give them an inch and they take a mile” Senate Republicans, after being given the courtesy of a two-week delay on Tom Perez’s committee vote to serve as Secretary of Labor, today invoked an arcane procedural maneuver to delay that vote for yet another week. As he has throughout his career, as labor secretary Tom Perez will stand up for the rights of working people. For Senate Republicans that’s exactly the problem. 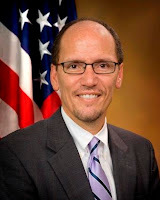 So Perez has become the latest target of a never-ending Republican campaign of fear, smear and obstruction. The delays must stop here. It’s time to confirm Tom Perez and give working Americans the champion they deserve.